White Pass marked the last time that we would see Macro's family this trip. 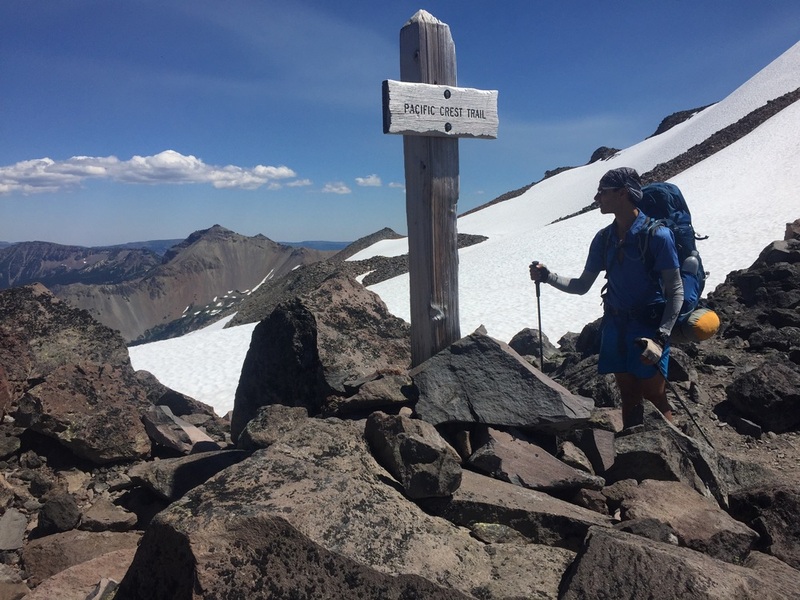 They have been incredibly generous with their time, driving many hours to meet us at pre-arranged times each place the PCT crosses a major highway in WA, and shifting their schedules whenever our hiking itinerary changed due to weather or trail conditions. Not only did they bring our gear and resupply boxes (and take our trash), but they acquired whatever else we thought to request and on top of that always showed up with a bounty of fresh food. Before we left them at White Pass I singlehandedly ate 1.5 sandwiches, an apple, a big juicy nectarine (possibly the tastiest thing I've eaten in a week! ), a pint of fat blueberries, a handful of carrots, a handful of Wheat Thins, a pint of OJ, and half of a mango smoothie. Macro probably ate more. And we had already eaten breakfast at camp, 3 snacks on the walk to the highway, and an ice cream bar each at the store. That's hiker hunger for you. Edie & Simon had brought a bag full of apples so I went around the corner to our friends and offered them up, joking that I was "selling" apples. The 3 girls immediately offered their souls for an apple each, and Nuthatch came by and said she'd gladly give the same. So I was 4 souls richer and had made 4 hikers very happy. Here's a huge thank you to Macro's fam, from the two of us and also from all of the other hikers who have benefitted from the spare food they brought. We'll be eating kale with the next few meals (pre-washed, and sent in a ziploc bag! ), then that will be the end of our fresh food streak. We started the climb out of White Pass and noticed that the forest was different on this side of the highway. It is drier, steeper, and has noticeably fewer mosquitos. We still applied DEET before we left, having learned our lesson the hard way. We found a few ripe huckleberries (score!) but most of the undergrowth was rhododendron, which was at least in bloom. Pretty, but not edible. We reached a small lake and stopped for a snack (the rest of the carrots) but didn't stay long due to you-know-what swarming around the minute we stopped hiking. As we continued to climb we started to get views of a rocky ridge to the east, and Mt Rainier to the west. The trail exits the wilderness briefly and there was a sign to "ski lift" trail. 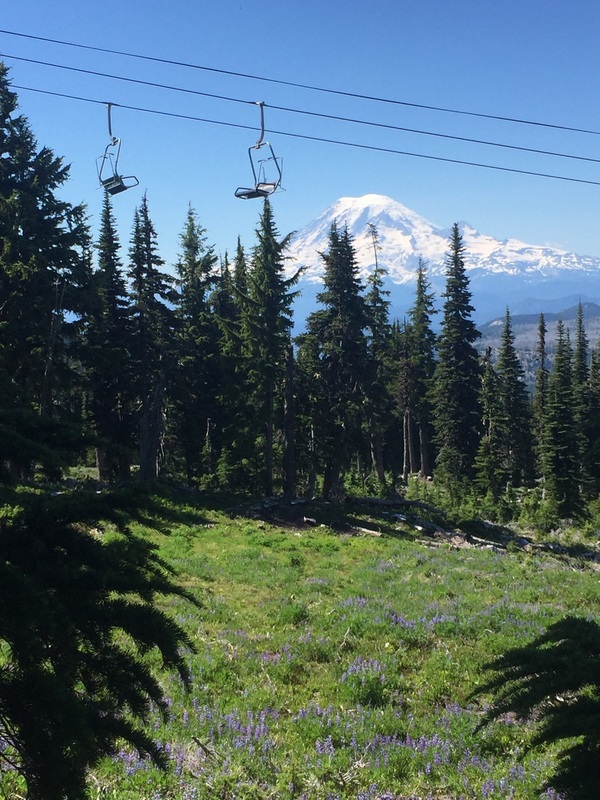 At the next switchback we realized we were walking along right next to the White Pass ski slopes, and in fact had a view of ski chairs hanging in front of Mt. Rainier. We joked that the PCT so far has been a tour of WA ski areas - we've walked up the slopes at Stevens and Snoqualmie passes, circumnavigated the valley containing Crystal Mountain, and now had a fine view of White Pass. It wasn't long before we were back in the wilderness and above the trees. The terrain was stark and windswept, with several large rocky prominences and a bare rocky slope extending off towards the east. Trees were scarce, and gnarled from the rough conditions. The rock was primarily volcanic, and the slopes still held patches of snow in the shade. 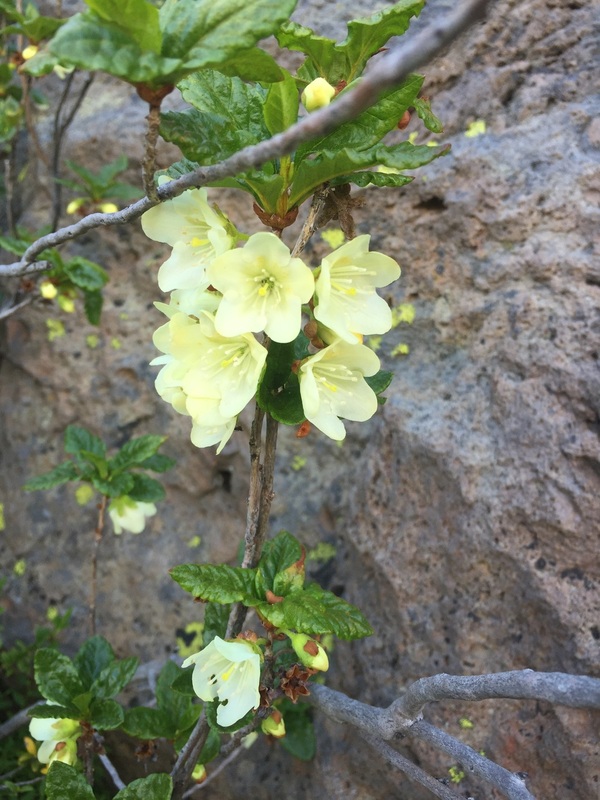 Of course there were wildflowers, but smaller in stature and adapted to a dry climate and rocky terrain. A huge advantage to our new terrain was a notable lack of mosquitos. We saw the trail stretch out ahead of us and realized we would be making a long ascending traverse across that rocky slope to a pass. The afternoon was hot, but there was a bit of a breeze and it was so good to be back in the wilderness that we didn't mind. The climb was gentle and we soon crested the pass. We were surprised to see a verdant alpine basin stretching out below us, with bilobed aquamarine Shoe Lake taking center stage as an infinity pool near the edge of the valley, surrounded by a ring of trees and endless slopes of wildflowers. Beyond the basin rose an imposing row of snow-covered peaks, and above them a perfectly blue sky. We knew right then we were going to enjoy this new wilderness area. Fresh kale makes everything taste better, thanks Penny! We continued hiking until around 7pm, putting in another 11 miles after our resupply and camping at Tieton Pass. We have both heard so much hype about the Goat Rocks Wilderness, especially the 'knife edge' of Old Snowy Mountain. Along with the bakery in Stehekin, it is the part of the PCT that people consistently mention and strongly recommend. It looked like we would have clear weather for this section, and we wanted to plan our hiking days to maximize our time in what is rumored to be the most beautiful area of the entire trail. I, of course, was dying to see more goats. Also, a part of me wondered if the trail could really be as spectacular as people say or if it would just be generally pretty but somewhat of a letdown. We had a look at our maps in the tent that night and decided to make a relatively short hiking day of only 14-15 miles for tomorrow, to allow us to lollygag through the high country and to camp before losing too much elevation (& presumably gaining mosquitos). The remainder of this section is fairly low in elevation, and we figured we could make up the mileage later. Day 24 dawned clear and warm. We got up at the usual time but had a seriously leisurely morning, not hitting the trail until after 8:30am. Our hike started in forest, and gradually climbed until we had views of those snow-capped peaks, now much closer than yesterday. Near the end of our climb out of McCall Basin we stopped for a snack. A large group of hikers came from the other direction and we learned that it was a 3-generational family group, with the youngest a 16-month old girl being carried in a pack! The oldest guy (dad/grandpa) lingered to chat as the others continued and we talked about hiking the PCT. He told us that in his lifetime he's hiked nearly every mile of the trail, and the section coming up for us over Old Snowy Mountain and down to Snowgrass Meadow is by far the most spectacular. There's that hype again. We hoped he was right. Less than a mile later we made a short shady descent then broke out into an alpine basin worthy of its own song. Huge rocky slopes covered with large sun-cupped snowfields formed the basin, clear snowmelt creeks tumbled over rocks, and every other surface was covered with green grass and blooming wildflowers. We had broad views below to distant valleys and blue ridgelines, and could see Rainier peeking behind a corner to the west. Butterflies were everywhere, and the sky was deep blue. We were starting to believe the hype. I kept my eyes peeled for goats on the rocky slopes, now that I knew what to look for. We could see plenty of game trails, and some of the snow patches even had hoofprints. But no goats. We took our sweet time on the relatively steep climb out of this basin and into the next, taking a million pictures and generally enjoying having this amazing place to ourselves. We crossed several small snowfields, and I availed myself of snow to put under my hat on this hot sunny day. As we continued to climb the terrain became rockier and less verdant, with only a few twisted and stunted trees hanging on for dear life. Mt. Rainier once again dominated the scene towards the west. To the south we could see the jagged rocky ridge that held our undulating trail towards Old Snowy Mountain, and across a deep valley were the snow-covered peaks we'd seen since entering the wilderness yesterday. We rounded a knob at ~6400' and headed south on a narrow, rocky trail high along the ridgeline. This was well beyond "no gawking & walking" and into YSYD (you slip, you die) territory. We made terrible time due to constant pauses to exclaim about this view or that, or the amazing wildflowers at our feet. We continued to take a ton of pictures, and were careful to watch our footing. 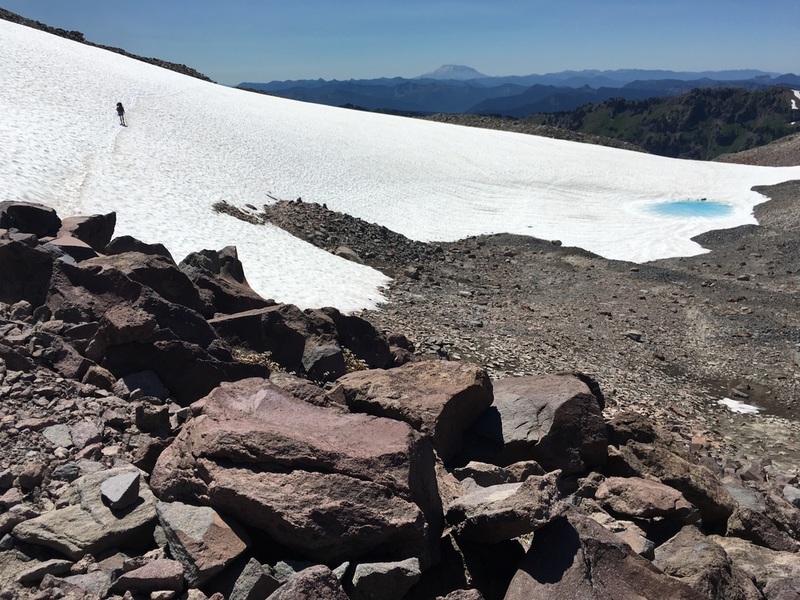 The Packwood Glacier was in full view and our rocky trail stretched out in front of us as an impossibly thin, narrow line along the ragged spine of the ridge. We passed a few hikers in this section, fortunately each time one of us was able to find a wider section to step aside and wait. We finally reached the Coyote Trail junction, a tiny plateau from which a mountain-goat type trail descended to the valley below. The signpost had a skull sitting atop, somehow fitting in this stark environment. It was windy, but not so strong as to make the exposed walking uncomfortable. From here, the trail became steeper and more narrow and every quarter mile we wondered "is this the knife edge?" As we have found so many times in the mountains, terrain often looks worse from a distance. We continued making our way along the trail that looked impossible from the last vista but found no part that was technically challenging despite some steep bits, some loose rocky ground, and a few areas that had been washed out making for some large steps. We stopped for lunch near a stand of krumholz trees and watched a few hikers slowly make their way across large snowfields at the top of Packwood Glacier. As they came by we asked how it was, and the first said it wasn't too bad, except that some mountain goats above them dislodged some rocks and may have covered their footsteps in the snow. They made it across but it was scary. All I could think was - goats! The second chuckled and said "if you hear screaming, it isn't me. We had to take the low route instead of the knife." We packed up lunch and headed up the trail, trying to figure out from the map where to pick up the high route for the knife's edge. We immediately ran into a NOBO thru-hiker (started April 11) and asked him how the knife was. He said he didn't know, he took the low route because it was a bit shorter, and he wasn't sure how to get on the higher route from this direction as he hadn't seen a junction. He pointed in the distance to some hikers walking an exposed section and said that's where the two routes re-join. We had a look at our map and GPS and realized that what looked like a mountain goat trail just 50' above where we talked to him must be the start of the high route from our end. It wasn't signed, and looked to be snow covered for a bit, but we decided we had to at least give it a try. If this is the most spectacular section of the entire PCT, we are not going to skip it without at least a valiant effort. And there might be goats. 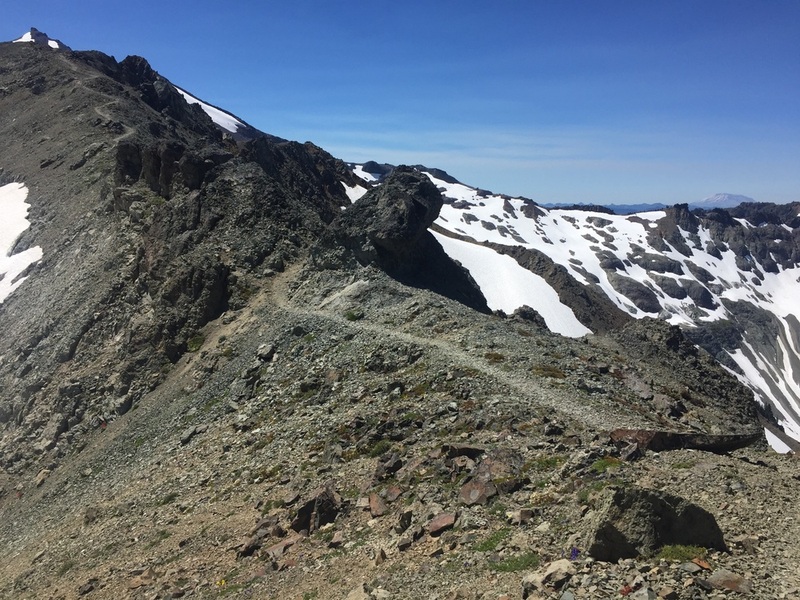 The high route climbed even more steeply, but after an initial indistinct and loose rocky bit it became a fairly well-defined rocky trail, similar to many approaches to high passes in the Sierra Nevada. When we reached the large and very steep snowfield we found we could skirt it in a little rocky gully. The rock below our feet was large flat flakes and made musical sounds as we stepped - Macro called it the mountain xylophone, and he wasn't far off. I suppose if you looked straight down it might be a bit scary but the trail itself felt much safer than walking across the Packwood Glacier with no traction aids. We reached the top of the route and walked the short "knife edge" section, with a steep drop-off on both sides. It was pretty spectacular. We had full-on views of Mt Adams, Mt St Helens, and Mt Rainier, and the summit of Old Snowy rose above us too. The only thing that could have made it better would be a handful of goats. But I guess you can't have everything. We started our switchbacking rocky descent, crossed a few large but soft and low-angle snowfields, and rejoined the main trail. I turned to Macro and told him that if we got to the last month of our thru-hike and skipped the best part just to save a quarter mile of hiking, I was going to be very disappointed in us. He agreed. HYOH of course, but we want to enjoy every bit of the journey. We already agreed that today has been the best of our trip so far, and expected that once we were off of Old Snowy the amazing part would be done. We were happily surprised to find that the next several miles were just as dramatic. We enjoyed views of a mostly-frozen lake in a high basin, deep blue pools of glacier melt, miles of rolling wildflower-filled basins, dramatic rock, and deep blue sky to rival what we take for granted in our home range of the Sierra Nevada. Mt. Adams became more prominent as we continued down the trail, and we started to see more and taller trees as the slopes started to provide some protection against the elements. There were several large snowfields to cross, all trivial in slope and surface texture. We ran into a pair of women day-hiking to the knife's edge from their campsite in Snowgrass Meadow and chatted briefly about the PCT. Last year they and a handful of friends had hiked the section from Harts Pass to Manning Park, and the youngest was 67! I love that so many people have a PCT story of their own, and that they want to share it when they hear we are thru-hiking. Not long after we passed them we found a perfect set of curved rocks in the sun that looked just like chaise lounges. Since our theme for the day was lollygagging, we dropped packs and lounged on the rocks for a bit while we enjoyed the plum fruit leather that my mom had sent to us at White Pass. A comfy rock chair, warm sun, blue sky, snowmelt creek burbling by, green meadows filled with wildflowers, and front-row views of three volcanos. Could life get any better? Day 25 couldn't possibly rival the day before, and we didn't expect it to. We woke to steam fog rising off of the lake, morning light on Mt. Adams, and a mist-filled valley below us. We hit the trail at our usual time and made our way down forested slopes into miles of brushy flat forest with several small ponds and marshes (another hiker we ran into called it the "pond forest" and that seemed about right). As you might have guessed, there were mosquitos. The trail broke out on a rocky shoulder for one last set of views to both Mt Adams & Mt Rainier, then dropped back into the trees and we passed out of the Goat Rocks Wilderness. Until next time, Goat Rocks (& I'll be looking for goats).